It might not look any different to the current model, but Mercedes-Benz claims there have been plenty of changes on its latest R-Class with re-designed exterior features and improved engines. The German car-maker has reworked the bonnet, radiator grille, front wings, headlamps and bumpers while the rear gets a new bumper covering, modified rear lights and integrated exhaust trim. Like the current model you get the choice of two diesel engines. The manufacturer claims the 300 CDI Blue EFFICIENCY now has improved fuel economy figures of 37mpg - up from 34mpg. 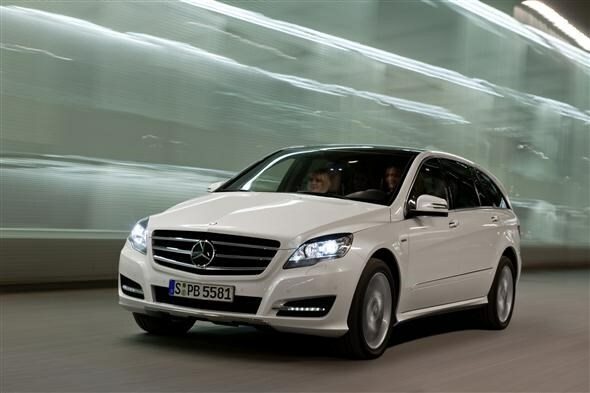 The 350 CDI L 4MATIC choice has been improved not only on fuel efficiency but also performance. With a claimed 33mpg - 3mpg better than the outgoing engine - it has also had the power boosted from 224bhp up to 265bhp, meaning it will now do the 0-62mph sprint in 7.6 seconds. As with the current version it comes with seven seats as standard in the normal and long-wheelbase models and options include a panoramic sunroof, a reversing camera and an electronic tailgate that can be opened from the front remotely with the key or a switch. There's a long list of standard safety equipment that includes eight airbags, crash active neck-pro head restraints, a tyre pressure loss warning system and adaptive brake lights. Deliveries will begin in September 2010 with prices expected to start at around £40,000.